​Our mobile app is changing the Real Estate Industry. 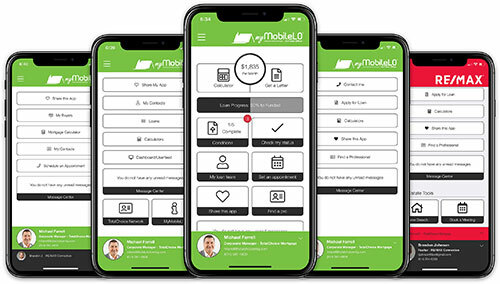 myMobileLO empowers Real Estate agents to take action & more accurately define EXACTLY how much home their buyers can qualify for. Built-in custom calculator lets you know exactly which homes your client can qualify for. Powered by careful Loan Officer consideration and review of your clients income, you only need to input proposed purchase price, down payment, taxes and HOA’s to determine if they are qualified. Want to know where your client’s loans are in the process what is next? Check on all of your Buyers Loan progress in seconds! If your buyer is qualified based on the accurate housing information on the app, you can have a pre approval letter emailed to you INSTANTLY. A simple, easy, and quick pre-approval letter at your disposal in a matter of seconds. Each time a new document is needed, you and your clients will be push notified and emailed with the new status. This real time, up to date list creates accountability and transparency. Leading to more timely closings, happy clients and more referrals! Give us a call and let’s talk about the Future, Together, Today! Get your loan process started today by downloading the myMobileLO app for FREE. Available in both the Android and Apple app stores. Use the links below to download.